Kiddie coasters are great for young riders. If you've never ridden a roller coaster but what to give these extreme thrill rides a try, you may wonder what are the best roller coasters for beginners? While there is no one ride that is perfect for everyone, choosing certain types of roller coasters and gradually working up to the larger rides can make coasters more enjoyable and less nerve-wracking. Roller coasters can be intimidating for novice riders. The steep, sudden drops, sharply banked curves, and other elements such as twists, launches, and inversions can be frightening, and there is a thin line between a fun, thrilling experience and a truly scary one. By riding beginner coasters first, however, a new rider can get accustomed to the feel of roller coasters with smoother, gentler rides before they challenge a park's most thrilling creations. So, What Are the Best Roller Coasters for Beginners? 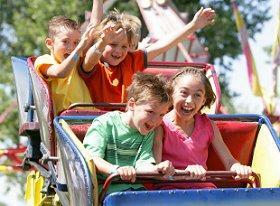 Which rides are the best for beginners depends on the novice rider's height. Younger, shorter rides have their choice of some less intense roller coasters specially designed for young riders, while adults who have never ridden a coaster need to take a different approach in their roller coaster education. Many traveling fairs and carnivals also have kiddie coasters, typically with names such as "Wacky Worm" or "The Dragon" to match the colorful trains. While at some parks family coasters are available to all guests, other parks may restrict the number of adults who can ride each circuit based on line length and the ride's individual design specifications. What are the best roller coasters for beginners if a park does not have kiddie or family coasters? In that case, novice coaster riders can first get accustomed to the different forces and feel of roller coasters by trying a range of smaller thrill rides that mimic some of those motions. Rides such as log flumes, Himalayas, Scramblers, and other spinning rides offer a lot of the same sensations that roller coasters do, and trying out those smaller rides first can prepare a novice rider for the more intense thrill of a roller coaster. Work up to larger coasters. Once a rider is ready to try a full size roller coaster, opt for a small coaster with a more gentle layout. 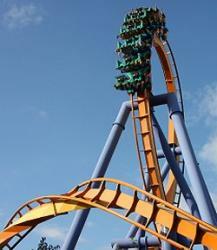 While all coasters have their own unique feel, steel rides tend to be smoother than wooden roller coasters, and shorter coasters will have fewer unexpected forces to unnerve novices. To determine which rides are best for beginning riders, look at each coaster's minimum height requirement: a coaster that allows riders to board when they are 42 inches tall is likely milder than a coaster with a 48 or 54 inch minimum. Riders can then work up through slightly larger, more intense rides until they are ready to tackle the largest, fastest, steepest coasters available. Watch a coaster carefully before riding it, noting how exiting riders look and watching the different elements of the ride so there are no surprises while riding. Avoid riding coasters on either a completely empty or completely full stomach, both of which could lead to nausea from the ride's unexpected forces. Secure all loose belongings in zipped pockets or leave them in a locker or with a non-rider so you do not have to worry about losing keys, cell phones, or wallets while riding. Keep all ride restraints such and properly fastened throughout the ride, and listen to and obey all ride operator instructions. Riding your very first roller coaster can be terrifically terrifying, but understanding what the best roller coasters for beginners are can help any new rider learn to enjoy these amazing scream machines.